No longer are teachers staying silent. No longer are parents writing off that these learning conditions for our students are short term. What is clear from Chicago is that this pattern to destroy public education by removing the voice of teachers and parents is everywhere. Chicago is not alone. They are not unique. They are not a special circumstance. They are us. In taking a look at Oregon, class sizes are ballooning, curriculum is narrowing, and testing is the top priority in determining student success. Both teachers and parents are starting to notice and finally realizing that this is not sustainable; our public education system can simply cannot go on like this. It is not good for our kids. It is not the quality education our government is supposed to provide. People are talking, and once people start talking, they start acting. It is only a matter of time. After listening to the grand plan of the OEIB, Gov. 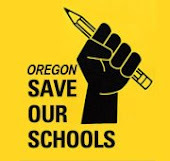 Kitzhaber and Dr. Rudy Crew in reforming our public education system, it is clear that the voice of the people, and especially the voice of those who work with Oregon's school children everyday---parents and educators--are being ignored. From Chicago, we learned that parents and teachers together will make the change that our kids need. We have to stand up for them at a time when no one else will. And the time is now. What do we want? Let's start with smaller class sizes, well-rounded programs and curriculum, sports, art, music, PE, fully-supported and staffed school libraries, an end to high-stakes testing, and a return to valuing our children as human learners rather than test scores and data points. Lately it seems that many of those making the education reform decisions really have no concept of what teachers do everyday--in the 21st century public school classroom. It is a different world with lots of promise and potential. What would they think of spending a day, or even two, in the classrooms of today? You know, that is a good first step. We at Oregon SOS encourage our leaders and decision makers to see what our schools look like on a daily basis. Often such leaders make a few minutes or hours of it, but to make it a day, and then come back for day 2, would be a valuable experience---one that would not only garner respect for our teachers and the reality of their work today but also give insight as to what our students really need to be successful. The next question would then be: are these things, such as smaller class sizes, in our Achievement Compacts, and if not, why not? One way to speak up is to attend any of the OEIB priorities and budget input meetings that are scheduled for the next two weeks. The one for Portland will be October 18th at Marshall High School, 6-8 pm. Check our "upcoming meetings" links for further information on these meetings. From Chicago, change will come to Oregon because we as parents, teachers, and community members know what is best, and our voices will no longer be ignored. It is only a matter of time, and our kids will thank us.